Thanks to two innovations in social media usage, Twitter has transformed into more than just a site for entertainers to connect with fans; it is now a driving force of political conversation, as well the preferred method of getting companies to pay attention to the needs of customers. President Donald Trump’s use of Twitter to connect with voters who endorsed him in his campaign and voted for him in the general election has increased the visibility and viability of Twitter as a communication website. At the same time, consumers have discovered that Twitter is a way to get the attention of retailers or service companies when they need attention, either because of a purchase gone wrong or a service poorly performed. Attentive companies are using Twitter to respond quickly to those complaints, and consumers are generally pleased with the results of those communications. For financial advisors, Twitter is a method of communication with clients, and a growing number of clients are looking to Twitter as a way to get their message across to the professionals modifying and maintaining their investment portfolio. Spectrem’s annual study Using Social Media and Mobile Technology in Financial Decisions examines the usage of the most popular social media sites by affluent investors. Twitter is not the most popular site; 17 percent of Ultra High Net Worth investors with a net worth between $5 million and $25 million use Twitter, while 52 percent use Facebook and 37 percent are on LinkedIn. However, investors who use Twitter do so habitually; 48 percent check their Twitter account at least once a day, a much higher visitation rate than any other site but Facebook. One-quarter of UHNW Twitter users go to the site at least twice a day. Some of that Twitter usage is so the UHNW investors can see what is going on with family and friends (59 percent follow relatives and acquaintances), political commentators (43 percent follow political people), and news commentators (41 percent follow news networks and show hosts). But 22 percent of UHNW Twitter users follow financial and investment commentators, in order to remain aware of what is going on with economic and market issues, and 7 percent follow their own personal advisor, with another 6 percent wishing they could follow their advisor. More than one-quarter of UHNW investors in the Millennial and Gen X generations want to follow their advisor on Twitter but are not yet doing so. Apparently, there are UHNW investors who search for their advisor on Twitter and do not find him or her. Are you one of those advisors investors cannot follow on Twitter? When an investors connects with an advisor through Twitter, they are having an electronic conversation, not a voice-to-voice discussion. And, although advisors cannot discuss investment recommendations via social media, they can comment on the markets, and discuss current or future plans investors have for their portfolio. Twitter, along with Instagram and Pinterest, are the sites UHNW investors say they most intend to increase their usage of. The attention Twitter has received due to President Trump’s use of the site translates into investors wanting to employ the site for their own needs, and one of their needs is communicating with their advisor. One of the newly discovered functions of Twitter is to complain to service providers. A tweet sent to a company can be seen by anyone who goes to the Twitter account of that company, and those companies do not want visitors to see an endless stream of unaddressed complaints. So they respond and they very often resolve the conflict. While only 2 percent of UHNW investors have employed that tactic to complain to their financial advisor, 60 percent of those who have done so have received a reply from their advisor. 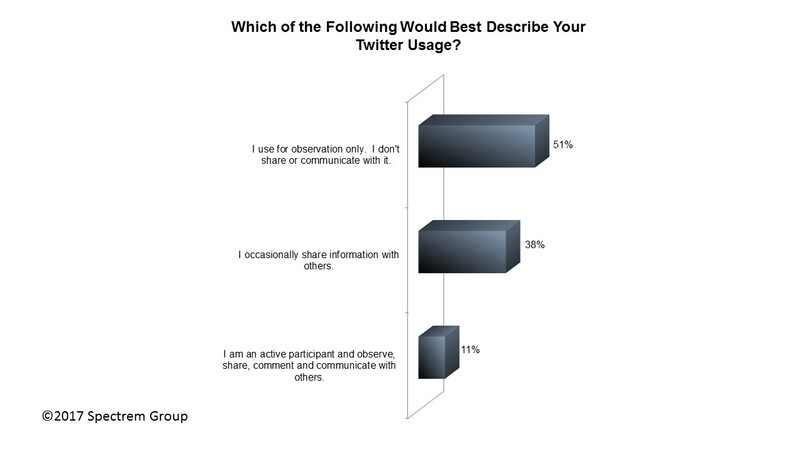 Expect that first percentage to grow as investors discover the value of communicating via Twitter. Due to federal regulations, there are conversations advisors cannot have with investors on social media. However, there are discussions that can occur via sites like Facebook and Twitter, and more importantly, those are communication vehicles investors want to be able to use. It is imperative that advisors make themselves available on social media sites and they need to be prepared to be responsive to requests for information on those sites. Spectrem research shows that investors looking for a new advisor examine the social media usage of that advisor as a requirement for a possible business relationship. Whether your firm fully envelopes the possibilities of social media participation, it behooves you to have a social media presence, because that is where some new clients are looking for advisors.